A few days ago I realized that I haven’t changed my iPhone password since I first purchased the device a year and a half ago. So I did what any normal person would do, I changed my password. After that I spent two days typing in my old password, getting rejected, and putting in the new password. No problem. I’d get used to the password. I was out at the Horseshoe Tavern with two thirds of Daniel, Fred, and Julie, and a friend of Julie’s from Hot Docs1. I was using my phone, I was still entering the wrong password initially and then putting in the right one, and all was working. Suddenly I put in my new password, and it rejected it. I put it in again. And again, and again, until I saw my phone was temporarily disabled. I tried my new password, I tried my old password. I typed it in super-meticulously and nothing worked. Sigh. I can blame the phone and say that it’s the phone’s fault. It somehow corrupted the password and wasn’t accepting it, but we all know that it was most likely that I thought I knew the new password but confused it somehow in my mind, but I can’t see how I did that. So in other words, it was probably my fault, but I want to blame the phone. Eventually I got to the point where my phone was disabled for 60 minutes. They decided to go see a late show at the Bloor for Hot Docs. I was interested in the documentary, but decided my time was better spent going home and fixing my phone, so that I’d have an alarm clock to wake me in the morning. 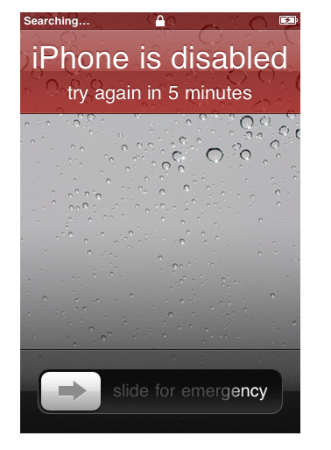 When I got home, I logged into iCloud and remote wiped my phone. I then plugged it into my media machine, and let it sync. After half an hour of restoring from backup, I realized that it was restoring with a year old back up. That won’t do. I wiped the phone once again, and then I unplugged it. Turns out if you want to restore from an iCloud backup, you have to do it when the phone is NOT plugged into a computer. I ran the iCloud restore, and it took a long time. It was pretty wonderful. Everything came down rather quickly. The restore happened faster than from the computer, which I don’t quite understand how that happens. It had to redownload all the apps, but it kept my screen layouts, and placement of all the apps and folders. However, if you’re going to restore your iPhone, make sure your iTunes account is up to date with the corrected credit card info. It wouldn’t download my apps that were attached to my anklewicz.com Apple ID. It did deal with the multiple Apple ID situation quite well, and the work apps (Server Admin, Workgroup Manager, etc.) all came down no problem. It attached all my settings, and all my content, all my iPhone photos, except for iTunes, and photos from my Aperture library, but those are all on my media machine, and ready to be synced. The only thing missing is yesterday’s text messages, as the last backup was from yesterday morning. Other than that. I have my phone as I left it. iCloud is pretty bloody awesome. Daily zero-effort backups are nice. If you are so good at restoring your wonderful iphone, why couldn’t you save my hard drive????? ?